Welcome to the opening of After Issac van Amburgh and his Animals at Stene Projects Gallery in Stockholm this thursday, May 4th. We are open between 5pm and 7pm, the exhibition then runs until June 3rd with the following opening hours: Thursday – Friday 12 – 17, Saturday 12 – 15, or by appointment. 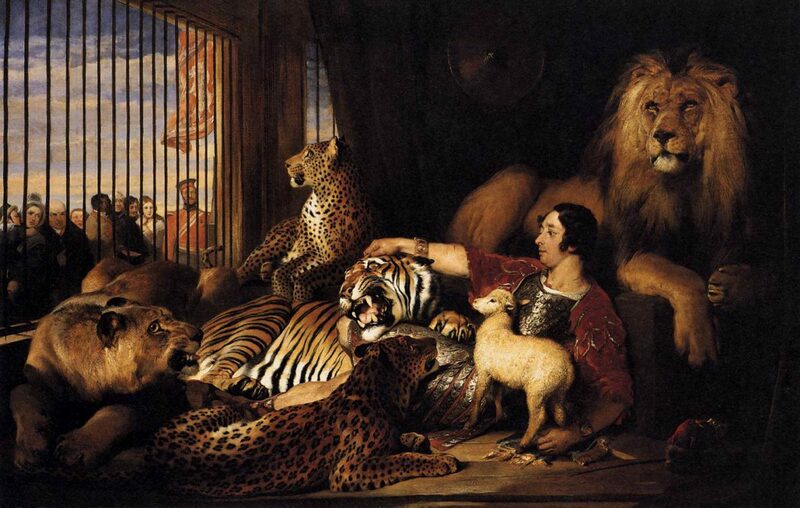 In 1839, Queen Victoria, Monarch of the United Kingdom of Great Britain and Ireland, commissioned a painting of the lion tamer Isaac van Amburgh surrounded by two lions, two leopards, a tiger, and a lamb. Edwin Henry Landseer, the British animal painter, was awarded the commission. Merely 20 years old, the Queen was deeply fascinated by van Amburgh’s performance, which she attended seven times over a period of six weeks. The motif of the painting is the finale of the performance where the lion tamer enacts a text from the Old Testament: “The wolf shall live with the lamb, the leopard shall lie down with the kid” (Isaiah 11:6). van Amburgh does not show any fear while reclining next to his animals, which are literally lashed into submission. The scene can hardly be called paradisiacal. For the lion tamer regularly beat the animals with a crowbar, and the violent elements in his enterprise resulted in him being criticised for his brutal methods. He himself thought that God had given mankind the right to dominate the animals. In her drawing based artwork “After Edwin Henry Landseer, Isaac van Amburgh and his Animals, 1839”, the artist EvaMarie Lindahl strives to break the seemingly cemented positions of power between human and animal. By redrawing Landseer’s painting she is questioning the original motif’s symbiosis of 1830s entertainment culture, Old Testament mythology, and mankind’s ancient wish to control the “wild”, which strikingly often involves other animal species. By using a method that can be termed “art history activism”, Lindahl approaches the experiences of the oppressed. In the above mentioned artwork, she decided to create an enlarged redrawing of Landseer’s painting in an attempt to rewrite its anthropocentric history. The frames of the original have been blown apart, and in the drawing the animals are depicted in their natural dimensions. Rather than expressing admiration for the violent trainer, the intention of Lindahl’s artwork is to emphasise the depicted animal’s experience of oppression. EvaMarie Lindahl’s monumental drawing is shown together with “The Choir of Isaac van Amburgh and his Animals”. The artwork, which consists of a printed poster, was inspired by 1830s advertisements for animal entertainment. These emphasised the animal’s unbridled savagery, something that most likely increased the number of visitors at the performances. As with her drawing based artwork, the artist is focusing on the subordinated ones. The voices in the “choir” belong to the animals that van Amburgh violently oppressed. These testimonies tell of whippings, starvation, and pistol shots. In combination with the drawing based artwork, the poster provides the viewer with a possibility to experience an increased understanding of what actually takes place inside the cage. 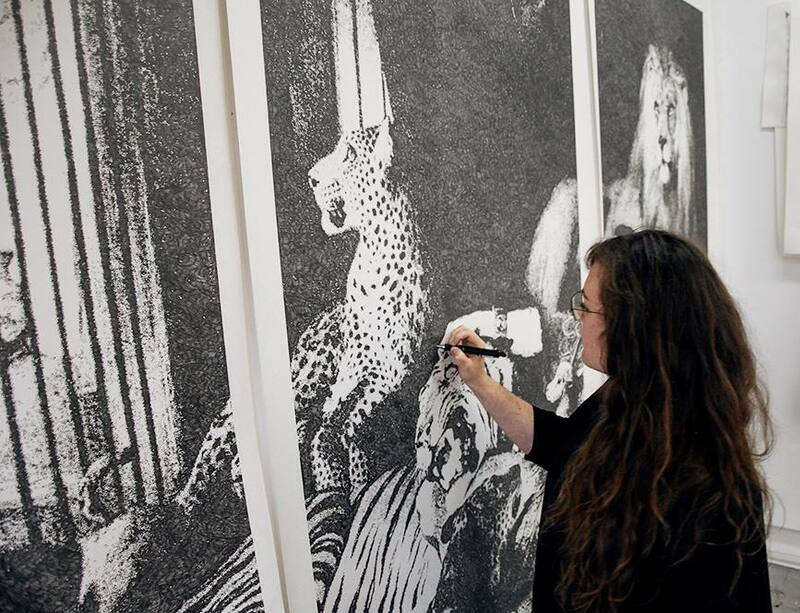 Lindahl’s exhibition is the result of extensive research and a long period of drawing. Together with the preliminary studies, “After Edwin Henry Landseer, Isaac van Amburgh and his Animals, 1839” took about a year to complete. The exhibition is part of the artist’s doctoral studies, and is the first part in a series of drawings. In her research, she investigates the term anthropomorphism (which, simply put, can be described as the humanisation of animals), and by using anthropomorphic methods she gives voice to the animals in art. Their participation is often stained with blood. For example, a fact that is rarely discussed is the immense amount of animal bodies used in art materials. Animal motifs are rather often painted with colour that contains animal ingredients. And even today paintbrushes are made of animal hair. By using drawing and text, Lindahl exposes the position of the animals in art history – an uncovering that can give us valuable insights into our standing as rulers over nature.